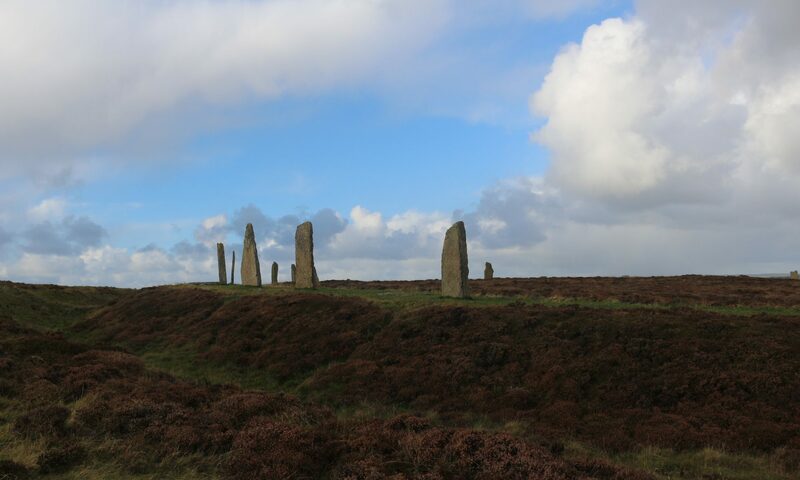 Situated on the 59th parallel North, Orkney is as far north as Alaska, Quebec, and Norway. It’s a collection of more than sixty islands, twenty of them inhabited, linked together by ferries. Islanders from Rousay and Hoy come in to do their shopping on the mainland, in Kirkwall or Stromness. The islands are surrounded by wind and sea and currents. The only trees grow in walled orchards or on carefully protected city streets. 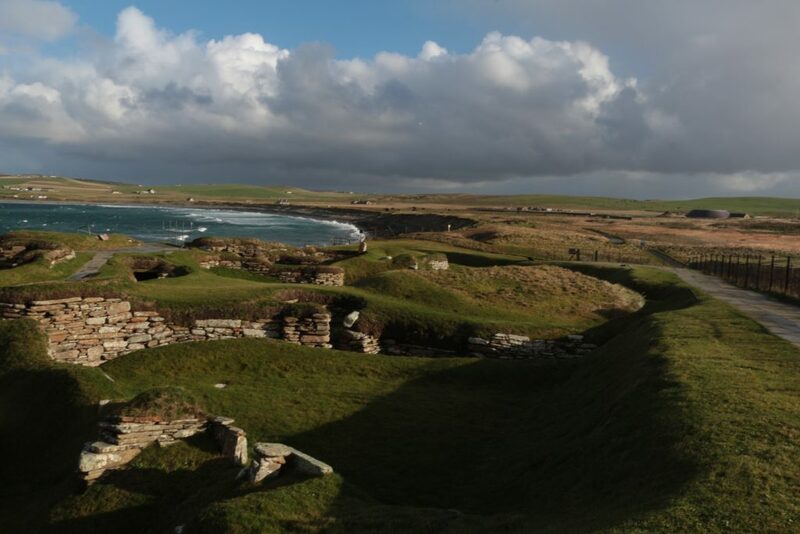 In the winter of 1850 a storm ripped the top off of a hill known as Skara Brae on the west coast of the mainland. Hidden underneath, almost perfectly preserved, was a Neolithic village. If you walk south of Orkney, in about five miles you’ll come to the Ring of Brodgar. The ring is 341 feet in diameter, the third largest in Britain, and was once made up of 60 stones. 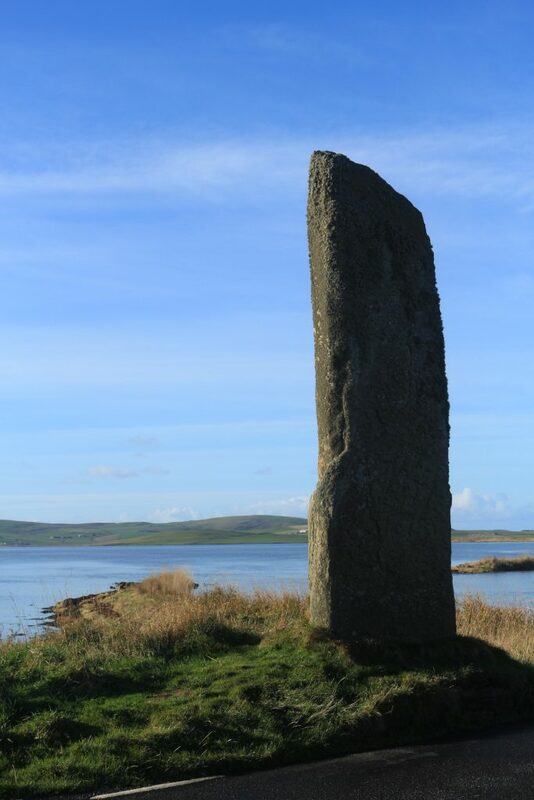 It dominates the peninsula between the Lochs of Stenness and Harray. 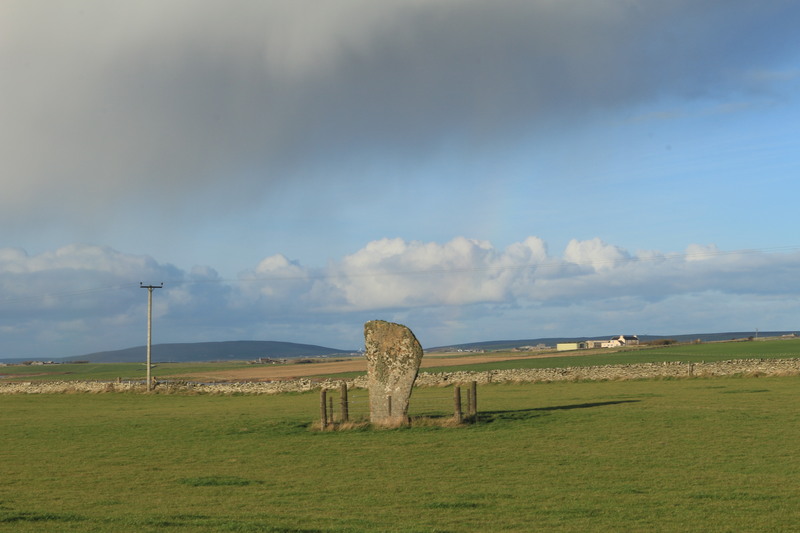 The Ring of Brodgar and the Comet Stone. Keep walking, and at the end of the peninsula you’ll pass the Ness of Brodgar. One of the largest Neolithic sites ever discovered, it is still under excavation, open only during the summer when the visiting archeologists are available to give tours to visitors. Within shouting distance of the Ness is the last remaining Watcher’s Stone. Standing guard over the causeway that connects the peninsula back to the mainland, it was once part of a pair. Not far off stood Odin’s Stone–a great standing stone with a hole in it through which bargains were sworn and informal marriages conducted until a farmer decided to put a stop to such heathen practices by destroying the stone. 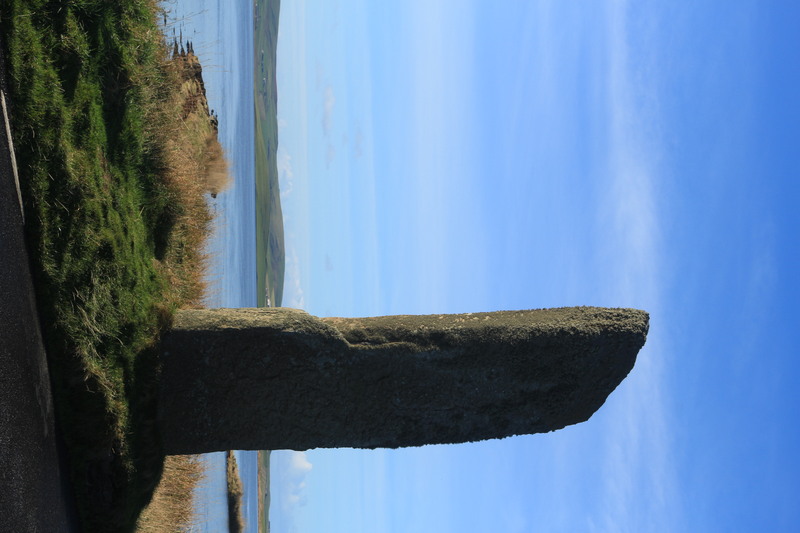 The Watcher’s Stone stands guard over the Loch of Stenness. The site of Odin’s Stone was very close to another Neolithic site known as Barnhouse Village. Barnhouse Village contained eight structures; the foundations of five are still visible. A path from Barnhouse Village will take you to the entrance causeway of the Standing Stones of Stenness. The stones are clustered around a hearth. Standing among them looking North you can still make out the Ring of Brodgar. 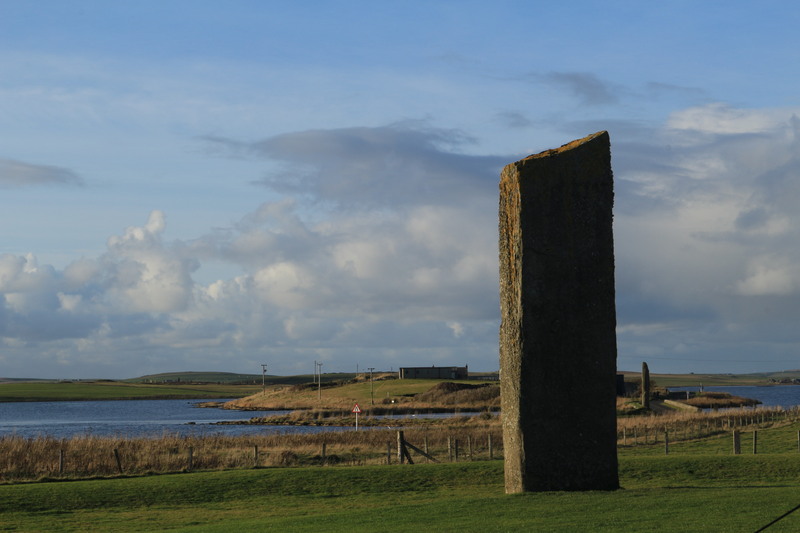 One of the Standing Stones of Stenness. 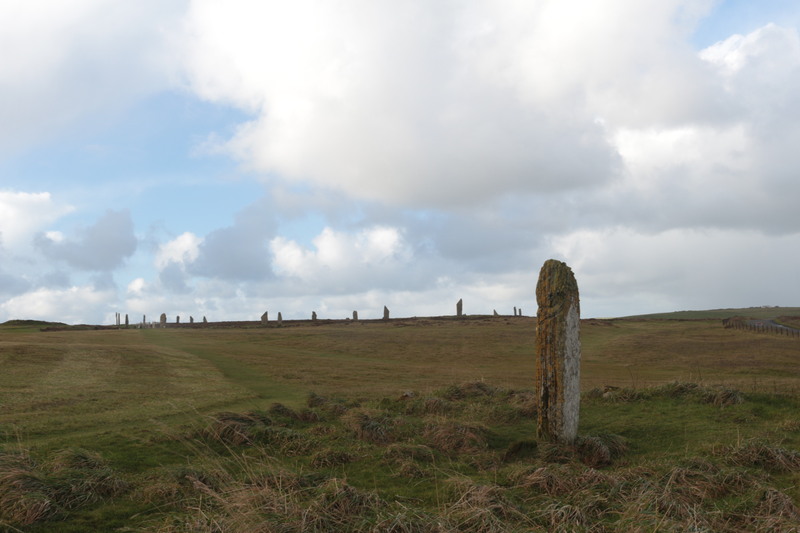 In the background is the Ring of Brodgar. 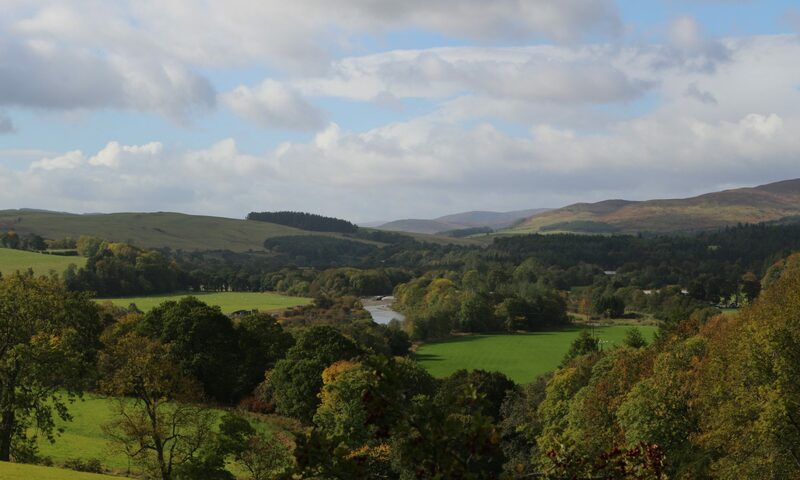 Half a mile on from the Standing Stones you’ll come to the A965. If you go left and East you’ll pass another standing stone, carefully fenced off to protect it from the surrounding sheep. On the shortest day of the year it is directly aligned with the setting sun. 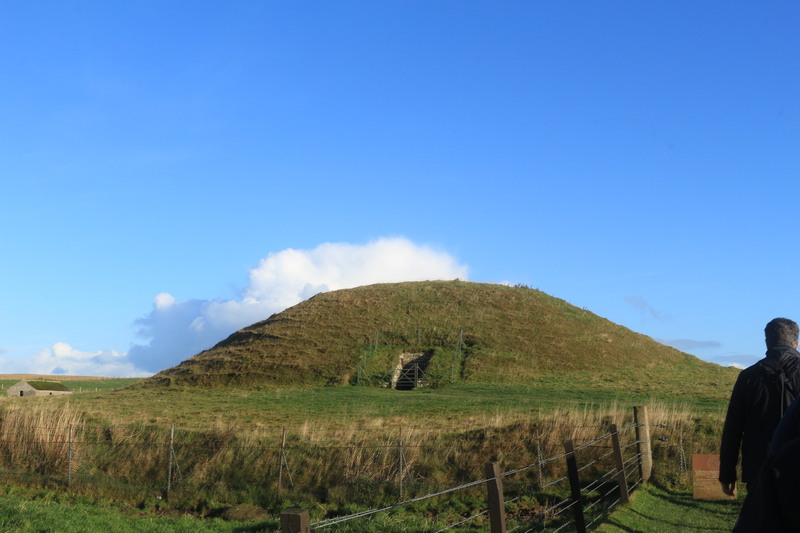 The long shadow that it casts will point to the doorway of Maeshowe–still half a mile east. 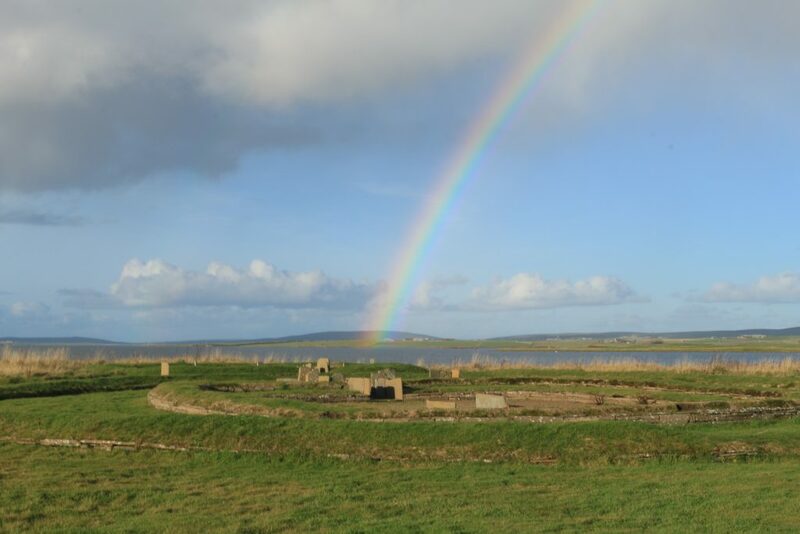 The Orkneyinga saga says that in the winter of 1153 Earl Rognvald and some of his men were caught in a terrible snowstorm and took shelter by breaking into the tomb. Their story is backed up by the inscriptions found within the tomb: Viking graffiti that shows however much the world may change, some things always stay the same.